A love story for the centuries. Jerry never expected anything other than an ordinary existence. When he wakes one morning to find himself in a different century, he embarks on one of the most baffling and difficult years of his life. He spends every day searching for a way to get home, but when the only person he believes can help him perishes in a fire, he worries he will be trapped in the past forever. His hope returns when a beautiful lass offers him aid, but with each passing day, he finds himself less sure of his desire to return home. The witch occupies his every thought. If she does find a way to send him home, it will mean leaving his heart hundreds of years in the past. If you enjoy Scottish highlanders, time travel, romance, adventure, and meddlesome witches, listen to all of the books in Morna's Legacy Series. This entire series has been a joy to listen to! Well written and easy to follow. This series is a must read for those who love to become intertwined with the lives of reading. I have read this series many times and now listening brings the story to lifw. This, by far is the best one in the entire series. So many of my questions were answered. WoW! What a great series! I’ve read and listened to many stories but the series “Morna’s Legacy” is my very favorite of all time, The author is brilliant in her story telling never, repeating a storyline and always allowing the reader to get lost in all its magic. Please write more-I love your stories! I’ve read all of the books in this series and was thrilled to find them on Audible. Great narrator. Good story. I’m so glad to finally know Morna and Jerry’s own story. I have listened to Morna's Legacy Box sets 1 & 2 already, but this explains the Story of Morna & her family/life. Loved all books! The Prequel we've been waiting for! If you are new to this series, you can tell by the title that it is Morna's Legacy Series. Each book can be read on it's own, but there are overlapping characters. But THIS book, is definitely the beginning. The series is a full of time travel and magic in the Highlands of Scotland. Orchestrating much of this match making is a Scottish witch, Morna, born in the 17th century, who now lives in the 21st century with her 21st century husband Jerry. This book is Morna's story. It starts with her as a young girl in Scotland with her brother and father, just learning how to be a witch. Her mentor witch Greer is teaching her, but at the age of 12, Morna's father banished Greer as he hates magic. This stops Morna's education, and causes loneliness and bitterness in the older witch Greer. Greer then casts a love casting spell for Morna, but not necessarily for altruistic purposes. Jerry is a 21st century man who wakes up finding himself far far away from home. He finally comes to the inescapable conclusion that he is out of his own time. But he knows farming, and he knows Scotland, so he gets by. After an accident traps him, Morna meets him, and our story begins. Our couple have many people plotting against them, trying to separate them, while others are falling in love with them individually. Still others hate Morna and fear her powers. Fall in love with Scotland, with magic and adventure, with Highlanders, with Morna & Jerry, and with Conall Castle (past and present) in Morna's Legacy Series! And Lily Collingwood really brings the story to life with her narration. I love the audio books! Love Beyond Reach is Morna's story. Since the first book, Love Beyond Time, I have wondered about Morna of why she is living in the present when she was born in the past and how Jerry came to be. The answers are finally here. Morna's education in witchcraft didn't go as fans of this series would think it would. Morna is challenged at every level but she finds a way to continue her education and be the person that her brother Allister has forseened her to be. She will be meddler in bringing soulmates together but she also has to learned to trust in her magic to find her happiness. Readers/Listeners will think this is the end of Morna's Legacy but this is a beginning of something new that may or may not branch off in a new direction for this series. 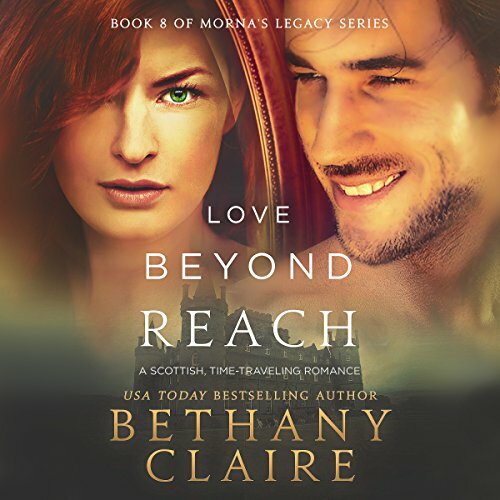 Love Beyond Reach doesn't disappoint except I did have high expectation because this is Morna's story. I would rate this book as a 4.5 stars if there are such thing as half star. I love, love the narrator, Lily Collingwood. She is the voice behind this whole series. I can't see anyone but her to be the right narrator for this series. I was given this audiobook by the author. I have volunteered to write an unbias review for this audiobook. I was not compensated or influenced in any way for writing this review. This is a great book; this is the eighth book in the Morna’s Legacy series written by Bethany Claire and narrated by Lily Collingwood. All Morna Conall wants is freedom - freedom to practice and learn about the magic inside her. Perhaps then her world wouldn't feel so small. When she finds the spell books and journals of an old mentor, Morna believes she's found the key to her happiness, but when she crosses paths with an injured man in need of help, her plans are derailed. As she spends more time with the strange but alluring man, her dreams change. Maybe magic isn't the only thing capable of expanding her world. Jerry never expected anything other than an ordinary existence. When he wakes one morning to find himself in a different century, he embarks on one of the most baffling and difficult years of his life. He spends every day searching for a way to get home, but when the only person he believes can help him perishes in a fire, he worries he will be trapped in the past forever. His hope returns when a beautiful lass offers him aid, but with each passing day, he finds himself less sure of his desire to return home. The witch occupies his every thought. If she does find a way to send him home, it will mean leaving his heart hundreds of years in the past.This is a great book with a wonderful story and well developed characters. The story flowed very well and was very enjoyable. This book will keep you reading long into the night and you will not want to put this book down until you finish. This was such a great read and full of surprises. The narrator did a wonderful job with this book. She did a great job with the different voices of each character in this book. It was very easy to listen to and I didn’t want to stop listening until the end. If you are looking for a great book with well-developed characters then you need to listen to this book. I am looking forward to listening to the next book by this author and narrator. I voluntarily reviewed an advanced reader’s copy of this book. The free book held no determination on my personal review.